Mike Iupati of the Arizona Cardinals is reportedly day-to-day with a triceps injury, which coach Bruce Arians hopes will not sideline the stalwart left guard for any meaningful amount of time. 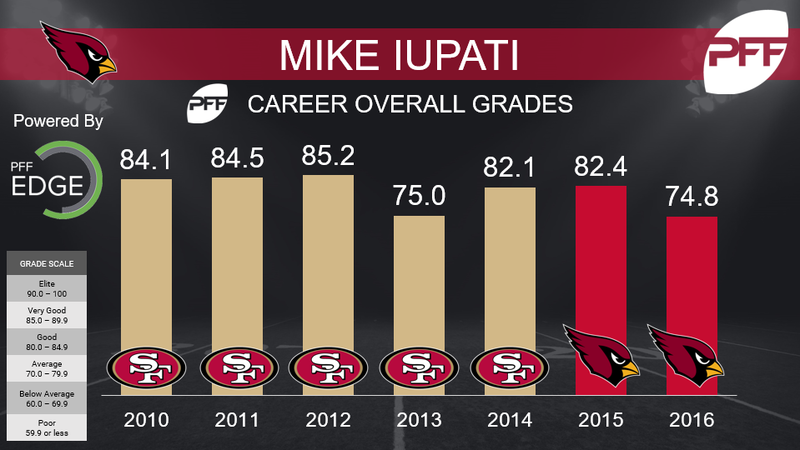 2016 was a relatively down season by Iupati’s lofty standards (likely due to a nagging ankle injury), as the 74.8 overall grade he earned was the lowest of his career. Despite this setback, Iupati has consistently provided value as an above-average run-blocker throughout his seven seasons (above 81.0 in six seasons), highlighted by a 2012 campaign when he was PFF’s sixth-highest-graded guard (85.2) and earned PFF’s third-highest run-blocking grade (89.3). While Iupati has always excelled in the run game, he has proved at times to be vulnerable in pass protection, with three seasons where he graded below 70.0. His pass-blocking efficiency of 96.1 ranked 35th of 61 qualifying guards in 2016. The Cardinals hope that his healed ankle and improved conditioning contribute to a bounceback season by the veteran in 2017.